While big cities like Santa Fe and Albuquerque receive most of the attention from travelers, there are many hidden gems scattered throughout New Mexico that are well worth the visit. In fact, some of these relatively unknown towns boast a wide variety of things to do that you won’t find in the larger cities. If you’re ready to travel off the beaten path and add unique activities to your romantic getaway or family vacation, here just some of the best small towns in New Mexico that you won’t want to skip! Planning a visit to some of the best small towns in New Mexico? Let us help you find all the best things to do while you’re there! Our complimentary Chimayo Vacation Guide is filled with all the best local activities, attractions, dining, shopping, outdoor recreation, and much more. With this handy planning tool in hand, you’ll be ready for the most unforgettable New Mexico getaway. Located just north of Santa Fe, this historic village is more than just one of the best small towns in New Mexico. It is the home of the famous Chimayo weavers, the red chile pepper, and the legendary El Santuario de Chimayo. Although the area had been occupied by Pueblo Indians for thousands of years, the village was officially founded at the end of the 17th-century by Spanish settlers in search of fertile lands. Today, many of the town’s traditions are still carried out by the villagers including blanket weaving, growing fruit and red chile, and raising cattle. Plus, Chimayo is home to our serene bed & breakfast escape, Casa Escondida! Our Chimayo inn is a go-to for couples looking to get away from it all and enjoy a traditional Southwest experience without sacrificing convenience to major attractions. During your stay with us, here are some local attractions that we’re sure you’ll love just as much as we do. 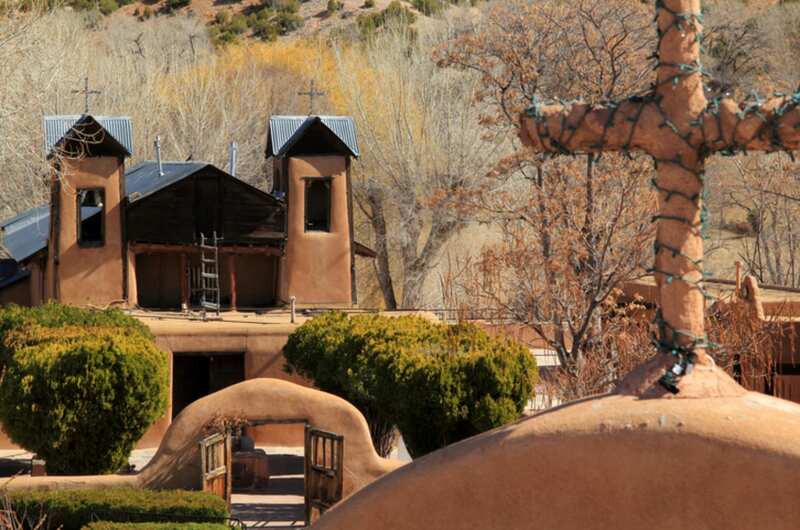 El Santuario de Chimayo: Our town’s most beloved point of interest is the El Santuario de Chimayo, a historic church that has certainly made a name for itself in the Catholic community. Not only was it the site of an unexplainable miracle during the 1800s, but it is the final destination for the annual Holy Pilgrimage and the best spot to collect Chimayo Holy Dirt, a soil rumored to boast miraculous healing abilities. Visitors are welcome to explore the beautiful grounds of the church or participate in one of the weekly services. Chimayo Museum: The Chimayo Museum is dedicated to educating the public about the rich history of Chimayo through several collections, special events, and a community preservation association. The museum is also housed in the Ortega Home where the world-renowned Ortega family of Chimayo weavers resided. Rancho de Chimayo: For over 50 years, this local restaurant has served tasty New Mexican cuisine rooted in ancestral family influences. It’s also one of our area’s most awarded eateries and has been credited with playing an integral role in the bringing of authentic New Mexican food into the international spotlight. You won’t want to leave without getting a taste of their sopaipilla relleno, platon especial, or one of their succulent cocktails! With a history dating back to 2,500 B.C., Jemez Springs is one of the most historic northern New Mexico towns. This land was originally inhabited by the Pueblo of Guisewa. Interestingly enough, many of the town’s residents are descendants of these ancient Indians. There are also many geological and cultural artifacts that still stand today, making it a must for history buffs! During your day trip to Jemez Springs, here are some activities that we most highly recommend. Jemez State Monument: This historic structure consists of the ruins of the ancient Jemez people known as the Giusewa and the 17th Century Spanish mission, San Jose de los Jemez. The mission had a unique octagonal-shaped bell tower, which is the monument’s main attraction. There is also a museum and signed trail at the Monument, which is part of New Mexico State Monuments. Jemez Springs Bath House: This unique spa is a must for those in need of a little TLC. You’ll enjoy a dip in a healing mineral bath, a deep and rejuvenating massage, and more. The Bath House is also a great spot for body scrubs, waxing, and other cosmetology services. Natural Hot Springs: It has been long believed that the volcanic aquifers that flow deep beneath the ground contain mineral waters with special healing abilities. These waters rise from their underground keeps and into many different springs throughout the state, many of which appear right here in Jemez Springs! Visit the Taos Pueblo: For over a thousand years, the Taos Pueblo has served as the home to a tribe of Pueblo Indians. Visitors are welcome inside the village to experience the everyday life of the locals and explore the historic Pueblo houses. Tradition dictates that no running water or electricity are allowed inside, so you’ll discover a whole new way of life inside the village. Ghost Ranch: This gorgeous landscape is a true haven for outdoor enthusiasts! In addition to a wide variety of challenging hiking trails, artists seeking some inspiration are also welcome to attend one of the ranch’s immersive art workshops. Stroll Through Taos Plaza: This 300-year-old center serves as the beating heart of Taos! Browse the picturesque art galleries, find some of the best boutique stores for shopping in Taos, or enjoy a live concert from May to October! No matter what you decide to do, taking a stroll through the plaza is an absolute must! Located along the popular Turquoise Trail, Madrid was the few places in the world that mined hard and soft coal. Today, the newly revived tiny town has become one of Northern New Mexico’s most beloved tourist destinations. They are most known for their famous Christmas Light Display, which has been a valued tradition since the 1920s. Fans of art will also get their mix in Madrid by visiting the town’s incredible art galleries. Also, don’t forget to try a signature Madrid Green Chile hamburger from the Mine Shaft Tavern! When most people hear the name Las Vegas, they think of the thriving city in nearby Nevada. However, New Mexico’s version of the glitzy town is much more laid back than what you’d expect. During your visit to Las Vegas, you’ll be able to see over 900 buildings that are listed on the National Register of Historic Places. This includes the nearly 250-year-old Plaza Hotel, which is known to have hosted outlaws like Billy the Kid and Wyatt Earp during the days of the Wild West. Visitors will also be delighted to find a thriving arts scene, immersive culture, and some of the region’s most fun events such as the Meadow City Music Fest.